A pattern language is defined in Wikipedia: http://en.wikipedia.org/wiki/Pattern_language. This concept is extended here to a pattern language of open source hardware. This language begins with words that make up sentences - or modules that meke up technological devices - according to rules of how the words are related - or the interface design between the modules. Sound design occurs when the modules and technologies follow OSE Specifications, and when these are extended to Distributive Enterprise, environmental regeneration, and social justice. Technology may be broken down into a collection of fundamental building blocks or modules that make up technological devices. When one understands how technological things work, it turns out that there is a rather small set of underlying building blocks that make up a large portion of technologies. Modules or building blocks of technology may be identified. These building blocks are like words that make up sentences. If we can understand the words, or building blocks, then we can master the language, or technosphere. The key benefit of a pattern language is the transparency that it sheds on the inner workings of technologies. This is the aim of exposing the underlying components of all technologies - so that people can understand the technology around them. Only when non-specialists begin to understand technology will humanity be able to master its technological base. When this happens, humans cease being slaves to poor technology choice, typically dictated from above. To understand the pattern language of technology, we began breaking down technological devices into their components. Here we discuss one possible breakdown. We chose a small set of technologies for building the infrastructure of Global Villages of tomorrow. These technologies are those discussed on the main page. These items are somewhat self-explanatory, and more discussion follows. Please view our past work for further explanation of this open source technology pattern language. The present work develops this theory further. It should be underscored that any community interested in its own self-determination should: (1), have production capacity of the essential components as part of its own infrastructure, or, (2), should have external relations established for providing these technologies without incurring geopolitical compromises. We are talking of basic needs here– and the basics must be provided internally to secure stable society by design. Note that not all of the Global Village Construction Set technologies of interest are represented in the picture above. This is because some of these are represented by combinations of the above icons. The last 5 icons in picture represent the major parts of a flexible fabrication facility. The difference between the past work and the picture lies in a few updates that arise from experience gathered since the former report was published. There are 4 main differences. The first difference is that the new set eliminates the former pulley and the power transmission icons, as well as the electric wheel motor and electric motor (see last link) and replaces them with the wheel motor shown in the picture above. Wheel motors are high power, low speed electric motors that may be coupled directly to wheels, or other rotors, for powering vehicles or other electromechanical devices without the need of power transmission. They have no internal power transmission, either – as they are inherently suited to many direct-drive applications by design. The subtlety here is the proposition - known well in progressive vehicle design (such as Hypercars ) – that the availability of such wheel motors produces a great simplification in vehicle design. Pulleys, gears, and other power transmission devices – including drive shafts, differentials, clutches, and transmissions – not to mention grease and oil pans - are eliminated for gross simplification in the overall complexity of cars and other electromechanical devices. Moreover, the former electric wheel motor - which was a standard, high speed motor that included gearing in the icon set from 2006 – is eliminated for the same reason, ie, that power transmission has been designed out of the technology set. The key to this elimination is that advanced electric motor controllers, combined with the new wheel motors (high power, low speed) are able in themselves to produce the necessary dynamic range of speed and power that was formerly achievable only with various forms of mechanical transmission – typically gears and pulleys. Advances in electronics have made the former option obsolete – though the new choice is presently rarely used, due to industry inertia. The third difference is the elimination of the 6 hp stationary diesel engine, the 23 hp mobile diesel engines, as well as the steam engine, and replacing them with the boundary layer turbine. Our present research indicates that the boundary layer turbine is a robust, lightweight, efficient, stationary or mobile engine that has the fuel flexibility and application flexibility that makes the former options obsolete. Diesel engines and steam engines are much more complicated to build than the boundary layer turbine, which consists mainly of a shaft with a dozen or so closely-spaced, flat disks acting as propellers for transforming the energy of a working fluid into rotary motion. Since we have verified performance data in the literature (Rice, Warren, "An Analytical and Experimental Investigation of Multiple-Disk Turbines", Transactions of the ASME, Journal of Engineering for Power, Jan. 1963, pp.29- 36. ), and identified a prototyping firm capable of delivering a working turbine, we decided to pursue it as a short-term feasible item. Steam engines still appear attractive, and are simpler to fabricate than diesel engines, but their low efficiency (approximately 1-8% overall efficiency for a basic system ) makes them appear to be an inferior option. Modern gas or diesel engines and standard bladed turbines are avoided due to high complexity. Last, the fuel icon shall include both fuel alcohol and compressed gas. In this process, local resources are used whenever possible. The 5 last technologies – the Fab Lab for the means of fabrication – may be used to fabricate all the other technologies from scratch – including the means of fabrication themselves. This is what is meant by the closed arrow loop in the above figure for Flexible and Digital Fabrication. The Fab Lab is responsible for technological self-replication. The nursery is responsible for plant self-replication – namely fruit trees. Animals are also self-replicating in a land-based facility, and they are a contribution to an integrated ecology. In this sense, the whole package is self-replicating. Combined with the low cost of the various components, and the documentation and training that Factor E Farm aims to generate, the whole package is meant to constitute a highly-replicable instance of a Global Village. Turnkey greenhouse systems: This includes glazing extrusion and fabrication of modular greenhouse panels using dimensional lumber and extruded glazing. SolaRoof insulated greenhouse panels are of particular interest. Green building design-build operations - including Living Machines and attached greenspaces. Focus is on shell houses, adaptable living space, and potentially non-greenhouse dynamic liquid insulation. It should be pointed out that a particularly exciting enterprise opportunity arises from automation of fabrication, such as arises from computer numerical control. For example, the sawmill and CEB discussed above are made largely of DfD, bolt-together steel. This lends itself to a fabrication procedure where a CNC XYZ table could cut out all the metal, including bolt holes, for the entire device, in a fraction of the time that it would take by hand. As such, complete sawmill or CEB kits may be fabricated and collected, ready for assembly, on the turn-around time scale of days. If one were to sell such kits, that leaves room for large profit margins while selling the machines at a competitive price. This is indeed a fundraising model that we’re considering for funding further open source development. The digital fabrication production model may be equivalent in production rates to that of any large-scale, high-tech firms. Moreover, by keeping overhead down via open source design, production can occur essentially at the cost of materials. Digital fabrication product may be able to compete with globalization in terms of price itself, for many technological items. Consider mass production slave goods from China. It is foreseeable that digital fabrication has great potential in transcending the negative effects of globalization – such as returning manufacturing jobs from China to the united States. This type of localization program merits serious consideration. The heart of this system is a boundary layer turbine electrical generator (blue part in picture). This is the heat engine that converts a source of heat into electricity. Heat is used to generate steam in a heat exchanger. This steam spins the turbine. The turbine is connected to an electrical generator, and power electronics deliver the electricity for storage in batteries or utilization in a grid. Three sources of heat that we are considering are solar energy (solar concentrator icon), the Babington burner (green part in picture - It consists of two rotors: an air compressor for atomizing the fuel oil, and an oil pump, for delivering the fuel. The rest of the burner is a tubular structure, and power electronics for ignition. ), or heat storage (heat generator icon). The solar concentrator is the heat source of choice whenever the sun is shining. When surplus thermal energy is generated, that energy may be utilize to heat a storage medium, such as oil or a salt solution, stored in a leak-proof, insulated CEB cistern of about 2,500 gallons in size (cube of ~2 meter per side). Such storage is sufficient to serve as a heat generator for producing 1 kW of electricity and 10 kW heat continuously for approximately 24 hours. (One needs to step out of ignorance and consider a basic heat calculation to comprehend the large amounts of energy that may be stored in heated liquids. Consider salt solution temperature at 200C, such as that heated by solar concentrators, dropping down to 100C, or a change of 100C – which is an easy, practical scenario that does not require any high tech equipment. Approximate that the enthalpy of water is the same as that of salt solution. The amount of energy released by 2500 gallons of hot salt solution in this temperature drop is 10,000 liters x 100C x (1000g/liter) x (1 cal/gC)x(4 cal/J)=4x106 kJ. Consider that 1 kWhr = 3600 kJ ~ 4x103 kJ. Thus, 4x106 kJ = 1000 kWhr. Assume a very conservative overall conversion efficiency of 2%, and the result is 20 kWhr! That is approximately sufficient to power an average American household for a whole day (average consumption is 1 kW) When the sun does not shine for extended periods, the Babington oil burner is engaged as the heat source. If one verifies the last calculation and understands its significance, then one cannot help but be shocked at the ramifications. Consider this practical application of the conclusion that a 2.1 meter, or 7 foot, cube of heat storage medium can power an average American house for 24 hours as discussed in the last footnote. We cannot speak for others whether they are interested in this proposition taking them off the electrical grid. As for us at Factor e Farm, the conclusion is clear. We could either purchase a 20 kWhr flooded lead acid battery bank for $5k, or build the proposed storage cistern for probably 1/4 to 1/2 the cost using our CEB machine. After careful consideration, it appears that this option is much more attractive than pursuing battery bank additions. The only caveat is that the heat storage medium option requires an integrated, stationary CHP approach. If the storage cistern proves to be practical, that’s a resounding success for ecological living. The solar turbine ecology constitutes a combined heat and power system because the heat generated by the sun, burner, or extracted from heat storage may be used in other thermal applications. These include facility space heating; hot oil cooking (The Gaviotas community has such solar cooking in Colombia); industrial process heat, such as preheating, drying, or food dehydration; steam generation for steam cleaning or sterilization; and other heat-based applications. Special attention needs to be given to solar thermal concentrators due to their potential for cost reduction of solar electric power systems. Of particular interest are linear collectors with flat but inclined Fresnel-type collector surfaces composed of mirrors. (Check out the linear concentrators produced by http://www.hdsolar.com/ ) Linear collectors are utilized for the sake of scaleability: the power can be increased by increasing the length of the collector. Scaleability is not feasible in dish concentrator systems, where an individual dish cannot be enlarged easily. Moreover, linear collectors are easily mounted on the ground. Furthermore, if their horizontal length is much greater than their vertical height, they do not need a daily solar tracking device. The only solar tracking requirement would be seasonal solar declination adjustments. For a discussion of concentrating collector types, see Chapter 9 of Power from the Sun. 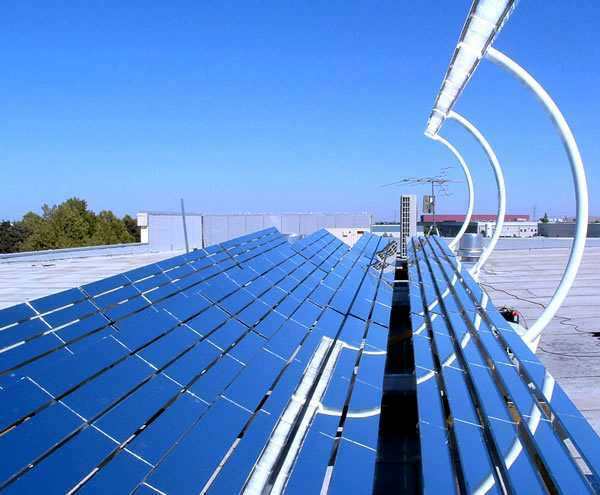 Optimization of linear Fresnel-type solar collectors indicates that total cost is <$200 for 3000 Watts of solar collection area, or approximately an 8x4 foot sheet (Glazing cost is $30 per 8x4 foot sheet. Structure is five 1.25 inch, 12 gauge steel frame members for $60 – where this cost may be eliminated by using lumber beams. The collector tube, and insulation compose the rest of this price.). This indicates 2000 Watts of usable steam power delivered if we assume a conversion efficiency of ~70% from solar income to usable heat such as steam ( 95% collector efficiency for solar thermal energy has been demonstrated in a Master’s thesis at Florida A&M University). This translates to 10 cents per watt of energy collected. Integration with a boundary layer turbine of 25% efficiency (Rice, Warren, "An Analytical and Experimental Investigation of Multiple-Disk Turbines", Transactions of the ASME, Journal of Engineering for Power, Jan. 1963, pp.29- 36.) indicates overall ~18% efficiency. This implies a cost of under 50 cents per watt based on predicted efficiencies, assuming that a large turbine, such as 10 kW, at a cost of ~$500 (Study the design in the figure below to calculate that material costs are approximately $200. Fabrication cost, utilizing XY-table CNC procedures, is negligible, such that overall cost is about $500, including labor. ), is utilized with a matched solar concentrator array. This is even lower than the breakthrough utility-scale solar panels that recently hit the headlines, at $1/watt (http://www.celsias.com/2007/11/23/nanosolars-breakthrough-technology-solar-now-cheaper-than-coal/ . Note: even though these came out, will the consumer ever be able to buy them? Right now, only utility companies are privy to the technology.). This design helps the reader to visualize that the proposed $200/2kW_thermal figure is realistic. This constitutes breakthrough price reduction that would bring solar thermal energy into the realm of practicality. For sufficient concentration to be achieved, we will need to use more than the 6 reflector slats as shown in the above figure. The central part of a car is its propulsion system. Fig. 6 shows a fuel source feeding a heat generator, which heats a flash steam generator heat exchanger, which drives a boundary layer turbine, which drives a wheel motor operating as an electrical generator. The electricity that is generated may either be fed into battery storage, or controlled by power electronics to drive 4 separate wheel motors. This constitutes a hybrid electric vehicle (The latest on hybrid electric vehicle design is the Hypercar), with 4 wheel drive in this particular implementation. The first step in the development of open source, Hypercar-like vehicles is the propulsion system, for which the boundary layer turbine hybrid system is a candidate. Our second step will be structural optimization for lightweight car design. The present mainstream trend is that advanced composites may capture the vehicle body market. A special case of an extremely useful utility device is a skid loader type of device similar to standard skid loaders and CadTrac. We are proposing our own version, OSTrac, driven by a boundary layer turbine coupled to a hydraulic pump. OSTrac is a utility vehicle, like CadTrac, with a front-end loader or a grapple. A backhoe and other implements may likewise be added. The device is hydraulically-driven, with hydraulic motors on all 4 wheels. Several features of OSTrac are noteworthy. First, if the Babington-turbine system is developed, then it requires only a hydraulic pump and 4 hydraulic motors to have a complete drive system. Second, the frame could be xyz-box beam construction, which is absolutely simple. In terms of structural integration, OSTrac could be scaled by linking two machines in line. Third, if open source hydraulic pumps and motors are developed, then we are talking of complete localization of key component fabrication. Fourth, OSTrac may have a multitude of applications. It can be used in ground preparation for building, or earth digging for CEB work. If it has a rototiller, it can be used for pulverizing the soil for CEB building. If it has a grapple, it can be used in log handling in forestry. It is a versatile device because of its small footprint. It can also be battery driven, either with battery-electric (this requires high-torque, low speed electric motors to be developed) or battery-electric-hydraulic drive trains. The heavy weight of batteries is an advantage for traction. A sawmill is an essential part of a localized economy. With abundant trees at Factor e Farm, we can engage in sustainable forestry by doing selective cutting that improves the quality of the forest over the long term. At the same time, we would be producing dimensional lumber for roofs, wood floors, door and window framing, raised growing beds, fences, and other household trim. 4 by 4 inch dimensional lumber is particularly useful in XYZ contstruction (How to Build Your Own Living Structures, (see review, Box Beam Sourcebook), and especially in the types of adaptable, modular housing units proposed by the Center for Maximum Potential Building Systems (See GreenForms: A building System for Sustainable Development here). This combines with other roundwood utilization, such as turning bowls on a lathe, making tool handles, growing bamboo for stakes, Osage orange fenceposts, LPSA construction, and others. Note that all biofuel sources come directly from our facility or from the waste stream. Waste vegetable oil is still widely available for free in the united States of America. Sustainable forestry trees from our facility, or woodchips, trim, and sawdust from external sources – may be utilized in compressed wood gas production. Fuel alcohol will be derived from waste fruit, as part of our perennial orchard strategy. Ponds will be utilized for algal production. We are focusing on proven technologies for our program. Fuel alcohol is one of them. We will start with a Babington-fired distiller and move into solar heating assist. A solar alcohol distiller prototype has already been demonstrated for Missouri via a SARE grant by Dan West (Look for Dan West at http://www.sare.org/2008Conference/breakouts.htm). We are collaborating with Dan, who is using waste orchard fruit, and is building a waste fruit picker and juicer under a continuing grant. Another proven technology is wood gasification. We are interested in compressing wood gas and storing it in gas bottles under medium pressure of about 500 psi. This is a technically feasible proposition, and we are aiming to produce our own cooking gas by utilizing small-scale, mobile equipment. Once again, we’ll be producing a mobile plant for education and demonstration purposes. The key point in the diagram is the solar turbine electric power, as the heat source of choice on clear, sunny days. Energy produced by the solar turbine may be used to charge electric vehicles. When surplus solar heat is available, that heat may be stored in thermal storage cisterns. This storage may be tapped on demand to cook food, or to generate power with the turbine by using a heat exchanger to boil water using the stored heat. Heat exchangers may be used for other thermal applications, such as solar drying or distillation of fuel alcohol. Flexible fabrication refers to a production facility where a small set of non-specialized, general-function machines (the 5 items mentioned) is capable of producing a wide range of products if those machines are operated by skilled labor. It is the opposite of mass production, where unskilled labor and specialized machinery produce large quantities of the same item (see section II, Economic Base). When one adds digital fabrication to the flexible fabrication mix – then the skill level on part of the operator is reduced, and the rate of production is increased. Digital fabrication is the use of computer-controlled fabrication, as instructed by data files that generate tool motions for fabrication operations. Digital fabrication is an emerging byproduct of the computer age. It is becoming more accessible for small scale production, especially as the influence of open source philosophy is releasing much of the know-how into non-proprietary hands. For example, the Multimachine is an open source mill-drill-lathe by itself, but combined with computer numerical control (CNC) of the workpiece table (Iceland Fab Lab project, http://smari.yaxic.org/blag/2007/11/14/the-routing-table/), it becomes a digital fabrication device. The first icon is the CNC Multimachine. (Multimachine , with CNC capacity added to it.) It is a high precision mill-drill-lathe, with other possible functions, where the precision is obtained by virtue of building the machine with discarded engine blocks. It is noteworthy that a high-quality, high precision machine may be made with discarded materials at a much reduced cost compared to the competition (Parts for a multimachine cost approximately $500 for a 3/4 ton Multimachine, compared to thousands for similar commercial mill-drill-lathe capacity.). The Multimachine is an open source project. You can find out more about uses and construction in the downloadable manual, and our webpage has just a few more notes about it. If one combines the Multimachine with a CNC XY or XYZ movable working platform – similar to ones being developed by the Iceland Fab Lab team, RepRap , CandyFab 4000 team, and others – then a CNC mill-drill-lathe is the result. At least Factor 10 reduction in price is then available compared to the competition. The mill-drill-lathe capacity allows for the subtractive fabrication of any allowable shape, rotor, or cylindrically-symmetric object. Thus, the CNC Multimachine can be an effective cornerstone of high precision digital fabrication – down to 2 thousandths of an inch. The XYZ table is a computer numerically controlled (CNC) platform for holding tools or workpieces, and for moving them in the X, Y, and Z directions. When we are discussing the XYZ table, we are interested in two types of applications. One is a large-scale surface, such as 4 by 8 feet, where the XYZ platform moves a tool, such as an acetylene torch for cutting metal or a router for doing cutouts in other materials. The second one is a small platform used in holding the workpiece, such as a piece of metal in a milling operation. The notable feature of the CNC XYZ table is that a number of groups worldwide is developing an open source implementation of the XYZ table hardware, controlling software, and toolpath generation. This implies that drastic cost reduction is forthcoming in the area of XYZ table equipment. The concept of a CNC XYZ table is powerful. It allows one to prepare all the metal, such as that for a CEB press or the boundary layer turbine, with the touch of a button if a design file for the toolpath is available. This indicates on-demand fabrication capacity, at production rates similar to that of the most highly-capitalized industries. With modern technology, this is doable at low cost. With access to low-cost computer power, electronics, and open source blueprints, the capital needed for producing a personal XYZ table is reduced merely to structural steel and a few other components: it’s a project that requires perhaps $1000 to complete. The plastic extruder (see Extruder_doc.pdf at http://www.fastonline.org/CD3WD_40/CD3WD/INDEX.HTM) (fourth icon in figure) is a device for extruding objects from molten plastic, just like a pasta maker extrudes spaghetti from dough. We are interested primarily in long sheets, for purposes of greenhouse glazing. Other applications may include thicker sheets of appropriate materials for wear plates, electrical insulators, and safety shields. If the extruder dye is selected accordingly, pipe and tubining may be extruded for water conduits and other purposes. Composite feedstocks, such as plastic and sawdust, may be used for making plastic lumber. If the extruder is used with an injection mold, then three-dimensional objects may be produced for countless applications. An ecological feature of the extruder is its compatibility with various feedstocks. Recycled resins from the waste stream may be utilized, such as local recycling center plastics. Mixed resins may be used for plastic lumber. Once we develop bio-plastic technology at OSE, we will use bioplastic from our own site, such as cellophane greenhouse glazing from trees. The noteworthy feature of the extruder is its ability to produce high-tech glazing at an affordable cost in a localized facility. We thus may be able to address the prohibitive cost issue for durable glazing systems. If the feedstock is a resin such as polycarbonate, then we can produce long-lifetime (20 years), high-performance, UV-stabilized glazing. If the extruder is an open source design, in the $1000 price range, then we are talking of producing single wall, 2 mm thick glazing at a material cost of 10 cents per square foot. (We begin with $2/kg cost of recycled polycarbonate resin crumbles. Polycarbonate has a density of ~1/2 kg per liter. One ends up with a material cost of $2 for 1 square meter of sheet with 2 millimeter thickness. This is about 10 cents per square foot.) For comparison, the industry standard, double-wall polycarbonate Thermaclear is about $2 per square foot delivered. (Quote from Regal Plastics, KC, MO, from 2005.) This price difference opens many enterprise opportunities for local economic development. It is especially interesting, from the localization perspective, that access to such low-cost glazing systems is a significant contribution to enabling the production of turnkey SolaRoof building systems. In particular, structural insulated SolaRoof panels may be constructued. These consist of a sandwich of two sheets of glazing with dynamic liquid insulation between the two sheets. These panels could utilize lumber, milled on-site, for the frames of these panels. If these panels have an interlocking mechanism, they can constitute a turnkey, SolaRoof greenhouse building system. The SolaRoof system may be combined with CEB stem walls and CEB water reservoirs. This constitutes a super-insulated, high tech, affordable, and ecological greenhouse and living space building system. The materials cost is under $1 per square foot for engineered (Engineered means that structural calculations may be made, as the building blocks themselves are uniform and their properties can be measured.) structure shells. This is possible due to utilization of onsite natural (If the particular location has lumber combined with clayey subsoil.) and external recycled resources – if the enabling CEB, extruder, and sawmill technology is available for fabricating the engineered building materials. Ramifications for localized food production and for affordable house construction are profound. Thus, it is of prime importance to open-source a robust furnace design, burner system, and all the techniques and insights of casting in various metals. It is also important to generate a repository of designs that can be produced on emerging open source 3D printers (such as RepRap), which can be used in mold-making for the casting process. Open source design is the key enabling feature. If a repository of scaleable circuit designs were available, then one could produce all types of circuits – for example for power inverters. If multifunction IC chips were available, then one could put together all kinds of devices readily. This is essentially the state of modern technology – but most people don’t participate in circuit making. This is because there are still many technical details to understand, and much of the information is still hidden or proprietary. Such useful equipment includes the motor controllers, grid intertie inverters, and chargers. These are still rather expensive today, and add thousands to the price of electric cars and off-grid power systems. These electronics should be available essentially at the price of components, and it’s our goal to develop such items in the open source context.